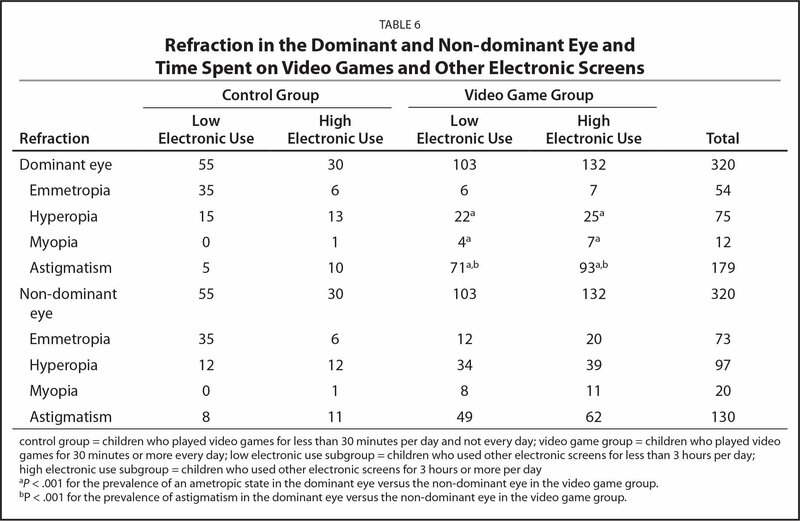 To examine a possible relationship between exposure to video games/electronic screens and visual issues in children between 3 and 10 years of age. An observational, cross-sectional study of a population of children using video games was employed. All patients between 3 and 10 years of age were recruited at an outpatient unit accredited by the Italian Regional Health Service. Three hundred twenty children (159 boys and 161 girls; mean age = 6.9 ± 2 years) were observed. Ophthalmological examination included assessment of stereoscopic vision on Lang-Stereotests I and II (LANG-STEREOTEST AG, Küsnacht, Switzerland) and identification of the dominant eye using the Dolman method. Furthermore, a questionnaire was used to record asthenopic symptoms and daily exposure to video games and electronic screens. Two groups of children were examined according to the average amount of time spent playing video games daily: children who played video games for less than 30 minutes per day and not every day (control group) and children who played video games for 30 minutes or more every day (video game group). Both groups were then divided into two subgroups: children using other types of electronic screens (eg, televisions, computers, tablets, and smartphones) for less than 3 hours daily (low electronic use subgroup) and children using other types of electronic screens for 3 hours or more per day (high electronic use subgroup). 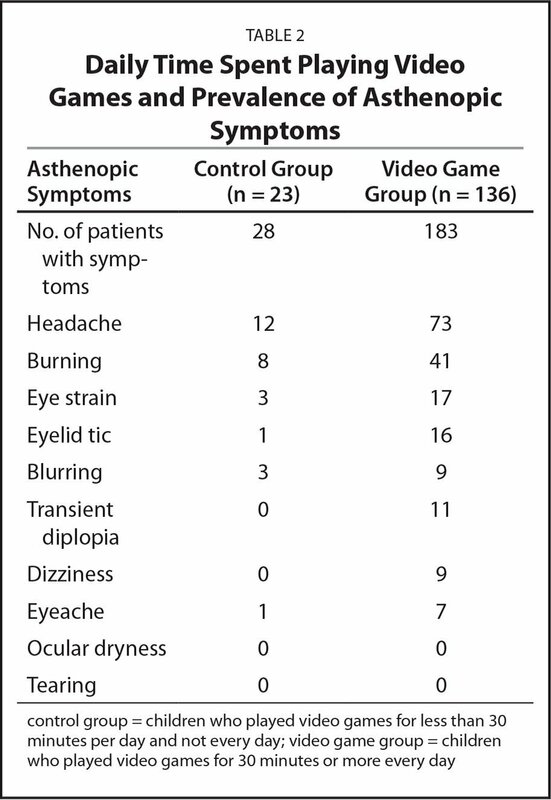 Asthenopia (especially headache, eyelid tic, transient diplopia, and dizziness), absence of fine stereopsis, and refractive errors were statistically more frequent (mainly in the dominant eye) in children in the video game group. These symptoms were frequent and peculiar in the video game group and might be part of a video game vision syndrome that has not been defined yet. It is important to recognize these signs as possible functional disorders to avoid erroneous diagnostic and therapeutic interventions. During the past 15 years, in their daily clinical work with children, the authors observed specific findings in younger children that had not been observed in previous generations. The authors hypothesized that the prolonged use of video games could potentially be harmful to the developing visual systems of children. The aim of the current study was to examine a possible relationship between certain visual issues in children and their exposure to video games and electronic screens. This observational, cross-sectional study was performed in an outpatient unit accredited by the Italian Regional Health Service and run by Dr. Rechichi. All healthy children between 3 and 10 years of age who attended the eye clinic between the beginning of 2012 and the end of 2013, either for routine examination or due to visual symptoms, were recruited. Exclusion criteria were congenital or acquired syndromes (eg, delays in mental development or severe hyperactivity) and eye diseases that cause alterations of the ocular surface or reduced visual acuity (eg, uveitis or albinism). The authors considered the ethical aspects of the study and followed the guidelines of the tenets of the Declaration of Helsinki. The study was approved by the institutional review board of the Department of Experimental Medical-Surgical Sciences of Messina University, Italy, and a signed informed consent form was obtained from the parents. The sample comprised 320 children (159 boys, 161 girls; mean age: 6.9 ± 2 years) who were examined by only one pediatric ophthalmologist (CR) using the same instruments (Table 1). The lower age limit of 3 years was chosen because this is the typical period when children start playing video games and using other electronic screens24 and the upper age limit of 10 years was chosen because the visual system of children is highly dynamic during the critical period and up to this age. The Lang-Stereotest is an easy-to-use test that uses random dots28 and cylinder gratings for image separation and is designed for the screening of stereoscopic vision in children. Two versions of the test plates, which differ only according to the three-dimensional objects to be recognized, are available. The Lang-Stereotest I displays a cat (disparity of 1,200 seconds of arc), a star (600 seconds of arc), and a car (550 seconds of arc), whereas the Lang-Stereotest II displays an elephant (600 seconds of arc), a moon (200 seconds of arc), and a truck (400 seconds of arc). In addition, the Lang-Stereotest II contains a star (200 seconds of arc) that can be viewed with one eye only. When viewed monocularly, these tests do not provide clues regarding form aside from the star in the Lang-Stereotest II, whereas each stereoscopic form can be recognized binocularly. In contrast to most random-dot tests requiring red–green or polarized glasses, the images of the two eyes in the Lang-Stereotests are separated by a system of fine parallel cylindrical stripes (ie, a lenticular screen). Beneath each cylinder, there are two fine layers of pictures, one seen by the right eye and the other by the left eye. This has two advantages in that no glasses are necessary and the eye movements of younger children can be easily observed. During examination, the examiner sits opposite the child to observe the eye movements more easily. The test plate is shown exactly at right angles and a distance of approximately 40 cm (16 inches). The child is asked whether he or she can see anything on the plate and the searching movements of the eyes are observed. When a three-dimensional object has been detected, the child is asked to look for additional objects and describe them. The child may then also point at the figures and should be able to determine which of them stands out the most. The possible results for Lang-Stereotests I and II are positive (correct localization and naming of two of the three hidden objects), negative (no object can be detected), and doubtful (only one hidden object is localized and named correctly). Assessment of refraction was performed using the KR8100P autorefractometer (Topcon Corporation, Tokyo, Japan) by taking at least five measurements for each eye before the evaluation of subjective monocular visual acuity with optotypes at a distance of 3 m in both non-cycloplegic and cycloplegic conditions. Cycloplegia was obtained by cyclopentolate drops (1%) administered twice at an interval of 10 minutes. Astigmatism was defined as any refractive error with a cylindrical component of ±0.50 diopters or more. Any non-accommodated eye requiring correction with a spherical component of +0.50 diopters or more to reach 10/10 was defined as hypermetropic. The study of ocular surface and anterior segment was performed with the SL-3E Slit Lamp (Topcon Corporation) and the examination of the fundus by direct (Miroflex H2; Heine USA, Ltd., Dover, NH) and indirect (Sigma 150; Heine USA, Ltd.) ophthalmoscopy. After the ophthalmologic examination, a questionnaire was used to collect the following information from the parents: the child's estimated average time spent playing video games (less than 30 minutes and not every day or 30 minutes or more every day), estimated average daily time spent using other types of electronic screens (less than 3 hours per day or 3 hours or more per day), and any asthenopic symptoms (ie, burning, blurred vision, ocular dryness, tearing, eye strain, eye ache, transient diplopia, dizziness, headache, and eyelid tic). Patients were then divided into two groups: children who played video games for 30 minutes or more every day (video game group) and children who played video games for less than 30 minutes per day and not every day (control group). Both groups were then divided into two subgroups: children who used other types of electronic screens for less than 3 hours daily (low electronic use subgroup) and children who used other types of electronic screens for 3 hours or more per day (high electronic use subgroup) (Table 1). The data obtained were collected and stored in a computer database (Excel 2013; Microsoft Corporation, Redmond, WA). The chi-square test was used for comparison and a P value of less than .05 was considered statistically significant. For statistical analysis, due to the low number of patients with phoria, patients affected by esophoria and exophoria were combined into a single group (heterophoria) because a functional imbalance of the eye muscles is typical for both phorias. For statistical analysis of stereopsis, the children with doubtful and negative results on the Lang-Stereotests were combined into a single group. Of the 320 patients, 49.7% (23 in the control group and 136 in the video game group) reported at least one symptom of asthenopia. Of these, 25.6% (85 patients) suffered from headaches and 3.4% suffered from transient diplopia. Furthermore, eyelid tic was present in 5.3% of patients and 2.8% reported dizziness (Table 2). When separating the patients according to time spent playing video games, 85.5% of the video game group had asthenopia (P < .001) compared to the control group. The comparison between the low electronic use subgroups within the control and video game groups showed a higher prevalence of asthenopia in the video game group (P < .0001), whereas the comparison between the high electronic use subgroups within both groups was not statistically significant because there was also a high prevalence of asthenopia in the high electronic use subgroup of the control group (Table 3). Of the 320 patients included in the study, 6 had microtropia according to Lang29 and were excluded from the statistical analysis of stereopsis. Considering all remaining patients (n = 314), 70.7% had stereopsis on the Lang-Stereotest I and 77.1% had stereopsis on the Lang-Stereotest II. When separating the patients according to their use of video games, the video game group showed a significantly lower percentage of stereopsis (62.3% positive on the Lang-Stereotest I, 71.0% positive on the Lang-Stereotest II) in comparison to the control group (94.0% positive on both Lang-Stereotests I and II) (P < .0001 for both Lang-Stereotests I and II). A comparison of the low and high electronic use subgroups within both the control and video game groups showed no statistically significant difference. The comparison between the control and video game groups showed for both the low and high electronic use subgroups that the results of Lang-Stereotests I and II were significantly worse in the video game group. Moreover, the results obtained for Lang-Stereotests I and II in the low and high electronic use subgroups within the control group were exactly the same, whereas there was a statistically significant difference for both tests in the video game group (P < .05) (Table 4). Only 18.2% of patients had heterophoria. Of these, 47.4% had esophoria and 52.6% had exophoria. The video game group showed a higher prevalence of heterophoria (22.5%) compared to the control group (6.0%) (P < .001). 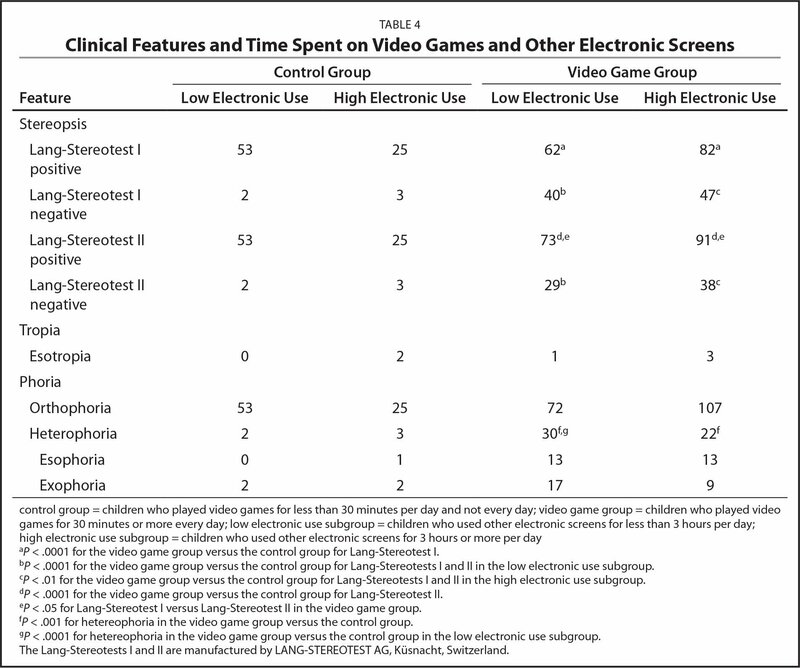 Additionally, when considering the low electronic use subgroup, the video game group showed a significantly higher prevalence of heterophoria compared to the control group (P < .0001) (Table 4). 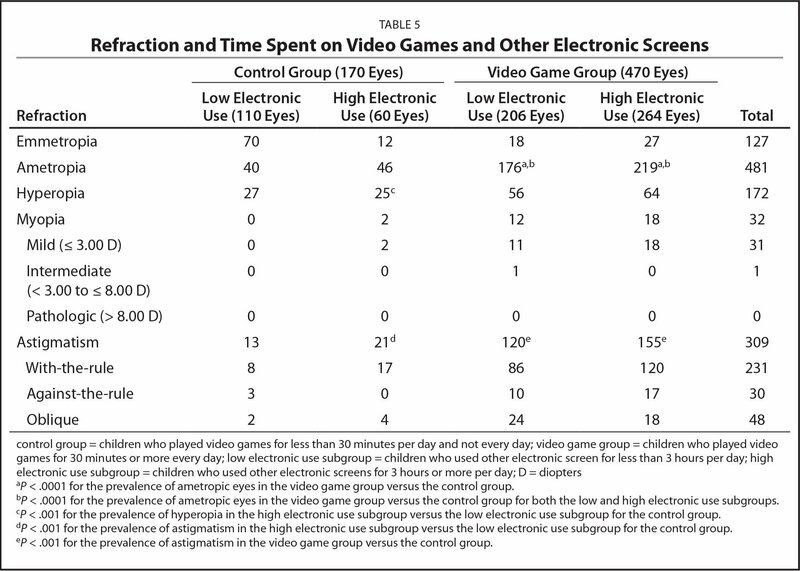 The video game group had a higher prevalence of ametropic eyes compared to the control group (90.4% vs 51.8% of eyes, respectively; P < .0001), which remained when the low and high electronic use subgroups were considered. Furthermore, the video game group had a higher prevalence of astigmatism than the control group (58.5% vs 20.0% of eyes, respectively; P < .001). In the control group (170 eyes), the high electronic use subgroup (35.3% of eyes) showed a significantly higher prevalence of hyperopia (41.7% vs 24.5% of eyes, respectively; P < .001) and astigmatism (35% vs 11.8% of eyes, respectively; P < .001) compared to the low electronic use subgroup (Table 5). Moreover, nearly all children in the study required the same correction, in both non-cycloplegic and cycloplegic conditions. Regarding refraction in the dominant eye, a prevalence of 83.1% of refractive error was observed for the whole sample. In the video game group, a higher prevalence of refractive error was found in the dominant eye than in the non-dominant eye (P < .001). Among the refractive errors, astigmatism had a higher prevalence in the dominant than in the non-dominant eye (P < .001). Such differences between dominant and non-dominant eyes were not found in the control group (Table 6). Recently, there has been a sharp increase in the number of children spending long periods of time using video games in addition to other types of electronic screens.9 The number of video games and the possibility of using them on laptops, large television screens, or smaller devices such as tablets or pocket-size smartphones has never been as great as it is today and these games have become accessible to almost every child in modern societies. Despite its observational character, the current cross-sectional study suggests that prolonged use of video games for 30 minutes or more almost every day in children up to 10 years of age might affect and compromise the development of their visual pathways. Could this complexity of symptoms be defined as a video game vision syndrome, similar to computer vision syndrome in adults, yet with some different features? Could the appearance of the highlighted symptoms in children playing video games be explained as the consequence of an excessive effort and a particular, fast, detailed performance of the still plastic visual system? Could the task of video gaming cause symptoms of both asthenopia and temporary cortical suppression of the non-dominant eye by mainly eliciting the monocular pathways of the dominant eye? The following observations might answer these questions. Third, on the Lang-Stereotest I, a highly prevalent loss of stereopsis in the video game group was observed, whereas exposure to electronic screens other than video games had no influence on stereopsis in both groups. Common visual tasks at video display terminals (eg, writing or internet surfing) typically provoke saccadic movements of both eyes, whereas video games, which require a quick response to speedy images, might elicit mainly the faster monocular pathways, primarily limited to the dominant eye. Under high-speed gaming conditions, binocular vision would be unnecessary or even counterproductive and would slow the total visual performance. According to several studies, the visual system of children is still at the developing, critical stage, and structural changes have been observed according to the required performance and/or environmental stimuli.31 Therefore, the brain of a video game player might adapt to the required task by increasing the representation of the dominant eye at the expense of the non-dominant eye. However, these players most likely have healthy binocular cells in areas 17 and 18 of the brain, which are not stimulated due to the monocular pathways that are served first. The greater brain representation of the preferred eye combined with the suppression of impulses from the non-dominant eye10,32 might determine an imbalance between the ocular dominance columns of the two eyes in area 17 of the occipital lobe, leading to loss of fine stereopsis.33 The statistically significant differences between the responses of Lang-Stereotests I and II in the video game group (highly significant absence of stereopsis on the Lang-Stereotest I and positive response to the Lang-Stereotest II) might be explained by the fact that, in contrast to the Lang-Stereotest II, the Lang-Stereotest I has no monocular reference. The presence of one monocularly visible target (star) most likely facilitates binocular vision,34 also leading to higher recruitment of ocular dominance columns in areas 18 and 19 of the striated occipital cortex. The easy-to-perform Lang-Stereotests, which are indispensable for the diagnosis of microtropia40 and in screening for binocular disorders,41–44 made it possible to discover this important feature. Furthermore, the comparison of the differing results between the two versions of the Lang-Stereotest could be useful for the study of stereopsis in stressing conditions (eg, video game playing), help with the diagnosis of the proposed syndrome, and eventually give us more information about the cerebral mechanisms of stereopsis. Fourth, visual defects were more frequent in the dominant eye of patients in the video game group. During examination in relaxed accommodation, reduced visual acuity in the dominant eye was found that could not be improved by correction.45 Additionally, the refractive errors found were more pronounced in the dominant eye. The higher the speed needed for playing video games, the greater was the effort required from the dominant eye to achieve the best performance in the shortest amount of time possible. Interestingly, reduced visual acuity often improved in cycloplegia, regardless of the nature of the visual defect. Fifth, a surprisingly large number of patients with an astigmatic defect in the dominant eye was found. This might be explained by the increased mechanical compression exerted by the contracted eyelid muscles during the child's concentration effort on his or her plastic cornea. Sixth, positive lens prescription for the correction of even minimal values of hyperopia was frequently required. Hence, underdiagnosing of the condition might also result in dependence on spectacles in young children. For obvious reasons of methodology, these observations could not be answered by the structure of the study. For example, no baseline data prior to the use of video games were obtained and the direct comparison of the low and high electronic use subgroups, which included electronic screens with different properties such as the size of images, movements, contrast glare, and the distance from eye viewing, could be confusing. Furthermore, data considering estimated playing time and parent-reported symptoms could have been biased by the perceptions of parents. Therefore, prospective studies will be needed, possibly in probands who were not yet exposed to video games and with increased exposure times according to a dose–effect paradigm. Even if the data and methodology of the study may be regarded as preliminary, the work describes some interesting findings and hypotheses that merit further in-depth research, including data from age-adjusted cohorts of children not exposed to video games. The results indicate that, although video games seem to improve the visual performance of adults,7,8 the constant use of video games in children may have an adverse effect on their visual system, which is more subject to modification by the stimuli received due to its neuroplasticity.10,11 Among all screen-type activities, video games are the source of stimuli that may cause the greatest and shortest-term alterations because they involve all brain functions rapidly and repetitively. This study had two aims: to draw the attention of pediatric ophthalmologists to the clinical features accompanying frequent video game use in children and subsequently prevent erroneous diagnostic and therapeutic maneuvers, and to stimulate further research. Recognizing these symptoms can improve the clinical approach, provide relief for the young patient's visual system, avoid unnecessary worries for parents, and circumvent the loss of time and money for inappropriate diagnostic tests in the assessment of headaches and general symptoms. More in-depth studies of these alterations are needed to improve understanding of the complexity of the visual system. American Optometric Association. Guide to the Clinical Aspects of Computer Vision Syndrome. St. Louis: American Optometric Association; 1995:1. Kozeis N. Impact of computer use on children's vision. Hippokratia. 2009;13:230–231. Heiting GH, Wan LK. Children and computer vision syndrome. All About Vision Web site. http://www.allaboutvision.com/cvs/children-computer-vision-syndrome.htm. Published 2010. Bedinghaus T. Playing video games may cause eyestrain: encourage safe game play guidelines for your child. VeryWell Web site. https://www.verywell.com/playing-video-games-may-cause-eyestrain-3421596. Updated: February 23, 2017. Rapporto Nazionale sulla Condizione dell'Infanzia e dell'Adolescenza [National Report on the Condition of Childhood and Adolescence]. Eurispes Web site. http://www.eurispes.eu/content/rapporto-nazionale-sulla-condizione-dell%E2%80%99infanzia-e-dell%E2%80%99adolescenza. Published: 2009. Wright KW, Strube YNJ, eds. Pediatric Ophthalmology and Strabismus, 3rd ed. New York: Oxford University Press; 2012:217–264. Lang J. A new stereotest. J Pediatr Ophthalmol Strabismus. 1983;20:72–74. Lang J. Mikrostrabismus [article in German]. Monographie, Bücherei des Augenarztes. 1973;62:1. Lang J, Rechichi C. Hypothesis on the mechanism of abnormal retinal correspondence: note III [article in Italian]. Bollettino d'oculistica. 1990;69:381–386. Lang J, Rechichi C. Considerations on some stereotests: note II [article in Italian]. Bollettino d'oculistica. 1990;69:373–379. Lang J, Rechichi C. Stereopsies in different types of strabismus: note I [article in Italian]. Bollettino d'oculistica. 1990;69:365–372. Kuzhda I, Pityk O. The case of acute strabismus (esotropia) and diplopia, provoked by severe neurogenic accommodative spasm in a child. Poster presented at: 36th European Strabismological Association (ESA) Meeting. ; September 2013. ; Marseille, France. . Von Noorden GK, Campos EC. Binocular vision and space perception: stereopsis. In: Von Noorden GK, Campos EC, eds. Binocular Vision and Ocular Motility: Theory and Management of Strabismus, 6th ed. St. Louis: Mosby; 2002:21–25. From Provincial Health Service 5, Regione Calabria, Reggio Calabria, Italy (CR, GDM), and the Department of Experimental Medical-Surgical Sciences, Section of Ophthalmology, University of Messina, Messina, Italy (PA). © 2017 Rechichi, De Mojà, Aragona; licensee SLACK Incorporated. This is an Open Access article distributed under the terms of the Creative Commons Attribution 4.0 International ( https://creativecommons.org/licenses/by/4.0). This license allows users to copy and distribute, to remix, transform, and build upon the article, for any purpose, even commercially, provided the author is attributed and is not represented as endorsing the use made of the work.